Please join us for the release of the Speak Up 2013 National Findings for Teachers, Administrators and Parents via our live stream feed. Go to the following link: http://bit.ly/SUCBLive today at 2PM ET/11am PT to watch it live! This is the second of two Congressional Briefings on the data results from the 403,000 online Speak Up surveys submitted from education stakeholders nationwide in fall 2013. The June 2nd briefing will include a presentation of the national findings and a moderated panel discussion on the impact of digital learning tools to support college and career readiness in K-12 schools with leaders in the education field. This year’s national report, “The New Digital Learning Playbook, Advancing College and Career Ready Skill Development in K-12 Schools” will be available for download to all those tuning in. We encourage you to take the conversation online and live tweet during the briefing! Don’t forget to mention @SpeakUpEd/@ProjectTomorrow and/or#SpeakUpBriefing so we can see what you have to say! This entry was posted in Speak Up and tagged Speak Up 2013, Speak Up reports on June 2, 2014 by project_tomorrow. 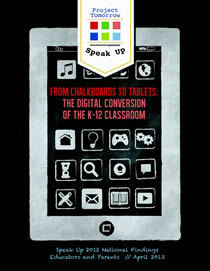 This new Speak Up white paper, analyzes findings on the experiences, insights, and desires of World Language educators in the United States and their use of technology, and is based on responses from over 56,000 K-12 teachers participating in the 2012 Speak Up survey. World Language teachers currently use technology at higher rates than the national teaching population to improve their personal productivity and effectiveness, personalize learning based on student need, and maximize student achievement in language acquisition courses for 21stcentury learners. The paper, a collaborative effort between Rosetta Stone Education and Project Tomorrow, also explores policy and infrastructure constraints that limit full technology integration in schools. World Language teachers are currently using technology at higher rates than the national teaching population. World Language teachers are using technology to improve their personal productivity and effectiveness. 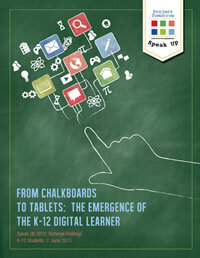 Policy and infrastructure constraints continue to limit full technology integration in schools. World Language teachers believe that technology has a fundamental role in maximizing student achievement in language acquisition courses for 21stcentury learners. 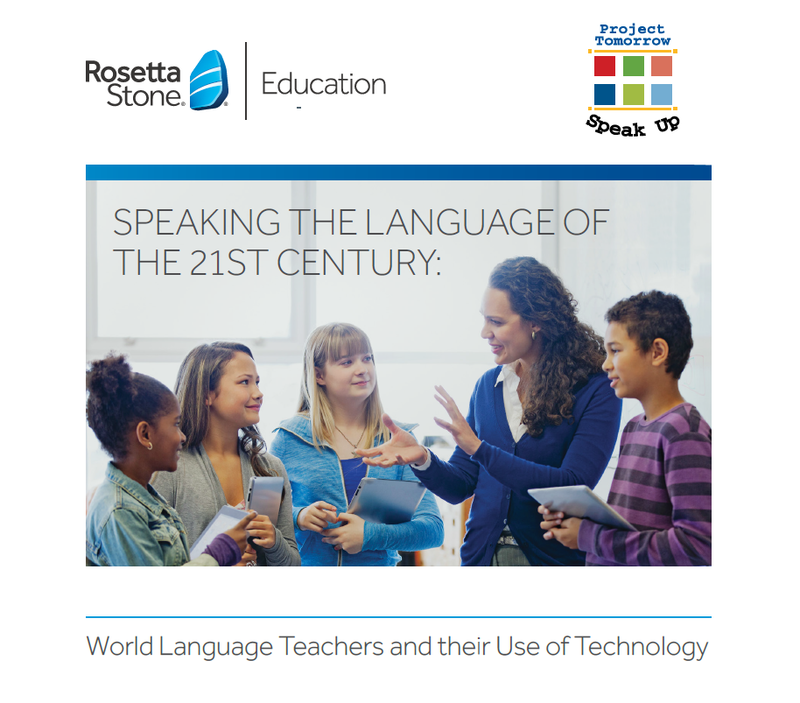 Click here to download a copy of the report from the Rosetta Stone Education’s website. To take the survey, visit http://www.speakup4schools.org/speakup2013, students will be required to enter in a survey password. Register as the primary contact of your school or district (at the link above) to manage your information, assign a student survey password to ensure confidentiality (all students will need to enter in the secret word to take the survey) and select an administrative password that will be used to access your local participant data beginning February 5, 2014. The data will be released on 2/5/14 in celebration of Digital Learning Day! This entry was posted in Speak Up and tagged national findings, Rosetta Stone, Speak Up, Speak Up data, Speak Up reports, World Language teachers on October 23, 2013 by Project Tomorrow.